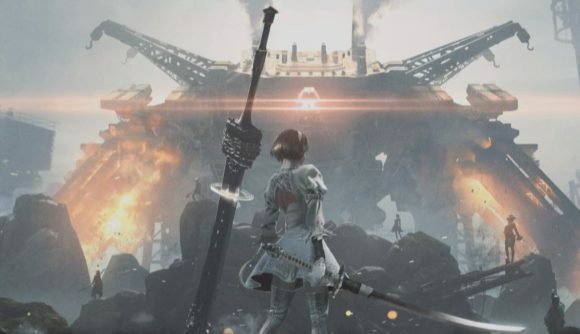 Final Fantasy XIV’s next expansion is going to include a raid series that’s themed directly after Nier: Automata, and Square Enix has enlisted Nier creator Yoko Taro to help design it. Final Fantasy XIV director Naoki Yoshida revealed the new raid at the game’s Paris fan festival today, introducing Taro and producer Yosuke Saito – a veteran of Nier: Automata and the Dragon Quest series – as special ‘guest creators’ for the Nier-themed raid. The new Alliance raid series will be introduced in Final Fantasy XIV Shadowbringers expansion, and is called Yorha: Dark Apocalypse. The key art shows a Yorha android very similar to Nier: Automata’s 2B standing in front of a hulking Goliath-class machine life form, with what appear to be additional Yorha soldiers in the middle distance between them. She is holding what looks like Virtuous Contract and Beastlord, two swords that appear in Nier: Automata. “This just looks like, yeah, a sequel to Nier,” Yoshida riffed onstage. And indeed it does – there’s nothing about the reveal art that indicates any continuity with Final Fantasy XIV. “So, how will this all fit into the Final Fantasy XIV world?” Yoshida continued. To answer (sort of), Saito and Taro appeared in a quick pre-recorded video. The pair joked around a bit, teasing each other about Final Fantasy fan status and not actually being in Paris. “There can’t be that many,” Taro quipped back without hesitation. So, there’s not much to go on yet for actual information about the substance or structure of the raid – but it’s set in the crumbling, recursive world of Nier: Automata, and Yoko Taro is working on it. We’ll likely learn more in the leadup to the Shadowbringers launch in July.